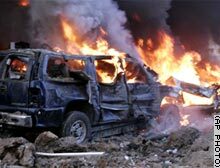 Former Lebanese Prime Minister Rafik Hariri was killed today in a huge bomb blast. Nine others were killed, and over a hundred were wounded. I note that the Daily Star, Lebanon's leading English-language publication, has no more than an AFP story so far. (They were down a few minutes ago.) They may have more later on, although they are generally politically cautious on Lebanon. The big question is going to be whodunnit, and what consequences will there be for internal stability and inter-confessional relations. If this is a move by Maronites to prevent Hariri from securing help from outside Lebanon to regain the prime ministership, things could become very ugly. And in any case, it will deliver a blow to the country economically, as Hariri's businesses account for a lot of activity.